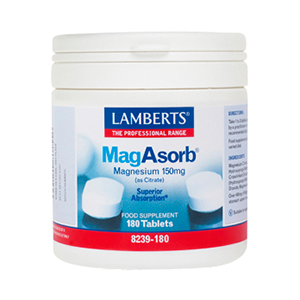 MagAsorb® is now one of the UK’s leading magnesium products, providing 150mg of pure magnesium per tablet. Magnesium is an important mineral that contributes to the maintenance of normal bones and the normal functioning of the nervous system. It also contributes to maintaining normal muscle function, including the heart muscle. Magnesium is also increasingly recognised as a nutrient that contributes to a reduction of tiredness and fatigue. Cautions Over 400mg of magnesium may cause mild stomach upset in sensitive individuals.